Selection of the best antigen to meet your project goals is an important part of the custom HuCAL® antibody generation process. Full length native proteins or soluble active protein domains are usually the antigens of choice and the preferred target for antibody generation. You may provide your own protein or we can generate the antigen for you as part of your project. Only 0.5 mg of protein with at least 80% purity by SDS PAGE is required. The sample buffer should not contain primary amines such as tris or glycine, additives such as bovine serum albumin (BSA), or detergents. If the protein contains a linker, a purification tag or a fusion partner, then 0.25-0.5 mg of an unrelated protein with the same linker, tag or fusion partner should also be provided. This material will be used for counter-selection and counter-screening to make sure that the antibodies delivered are specific for the protein of interest, and do not bind to the linker or tag. Peptides have limitations as antigens, due both to the reduced number of epitopes available and to their flexible structure. Antibodies against peptides are often of lower affinity than antibodies against proteins, and there is no guarantee that the anti-peptide antibody will recognize the parent protein. However, in some cases peptides are the only option, and selection of certain epitope-specific antibodies often requires the use of a peptide antigen, e.g. for generation of phospho-specific antibodies. Our routine method is to couple peptides to two different carrier proteins (BSA and human transferrin) using different linkers, with coupling via an N- or C-terminal cysteine. Alternative coupling strategies can be used where necessary. We can provide peptide synthesis and coupling services, or just coupling of existing suitable peptides. Using guided selection, HuCAL technology offers great advantages for the selection of anti-hapten antibodies with demanding specificities. Similar to the strategy used with peptide antigens, the hapten or homolog is coupled to two different carriers. When the protein antigen is unavailable, there are still other excellent alternatives to peptide antigens. We can arrange for cDNA clone purchase (where available), or gene synthesis of a selected antigen domain or of the full length antigen in order to generate an appropriate antigen for the HuCAL antibody generation process. AgX technology provides rapid, high level bacterial expression and purification of protein domain antigens from gene optimized DNA fragments. 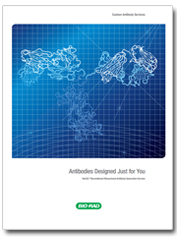 These protein domains of 100 to 300 amino acids (aa) are usually a good choice for the generation of highly specific monoclonal antibodies from the HuCAL PLATINUM® antibody library. We will assist in determining which regions of the protein are the most suitable for antigen generation based on the requirements of the antibody generation project, and then use our advanced bioinformatics tools to find the best sequences for antigen expression. Once the ideal sequence has been identified, we will arrange for synthesis of the gene optimized DNA fragment for expression in bacteria. Genetic fusion of the antigen encoding DNA fragment to the gene encoding a specific domain of the E. coli phage pIII protein results, in the majority of cases, in high-level of inclusion body production of the fusion protein. The inclusion bodies are solubilized and purified under denaturing conditions using a C-terminal His-tag and Ni-NTA chromatography. After purification, the protein is refolded. The AgX antigen generation platform is recommended for the generation of antibodies for western blotting and immunohistochemistry, or other assays in which non-native antigens are to be detected. Fig. 1. Antigens expressed as AgX fusion proteins. 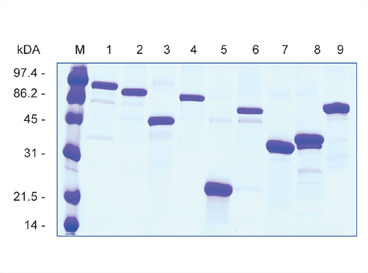 15% SDS-PAGE (reducing conditions) of N1-fusions of nine protein fragments ranging in length from 100 to 700 amino acids. N-terminal fusion of the AgX to the N1 domain of the pIII protein results in strong expression of protein fragments, while the C-terminal His-6 enables purification of protein samples under denaturing conditions. Mammalian expression systems are often preferred for the production of mammalian protein antigens. The period of time required to produce antigens in sufficient amounts using mammalian cell culture is longer than with E. coli. However, mammalian expression offers post-translational modification e.g. glycosylation, and a higher likelihood that the protein adopts a native conformation, as the mammalian protein folding system assists in correct assembly of the final product. We offer the expression of protein antigens in a human cell line. The protein can be fused to a leader sequence and to the Fc domain of human IgG1, which results in protein accumulation in the cell culture supernatant that can be purified using established Protein A chromatography. The resulting protein is dimeric. For the isolation of sandwich pairs the use of monomeric antigens is recommended. In this case the antigen is fused at the N-terminus to a leader sequence and at the C-terminus to a histidine tag to allow the purification of the secreted protein by NiNTA chromatography. Mammalian antigen expression is therefore the system of choice for proteins that should be close to the native state including potential glycosylation.